alisaburke: new class DOODLE DELIGHT and a giveaway! My favourite things to doodle are faces and trees. I would love to win a free spot in your Doodle giveaway :). I love to doodle flowers! Thanks for the chance,looking forward to your September Retreat. This class looks like a lot of fun. I love doodling flowers and swirly shapes so I am always in awe of your beautiful doodles. My fingers are crossed! I'd love to win a spot in this class. 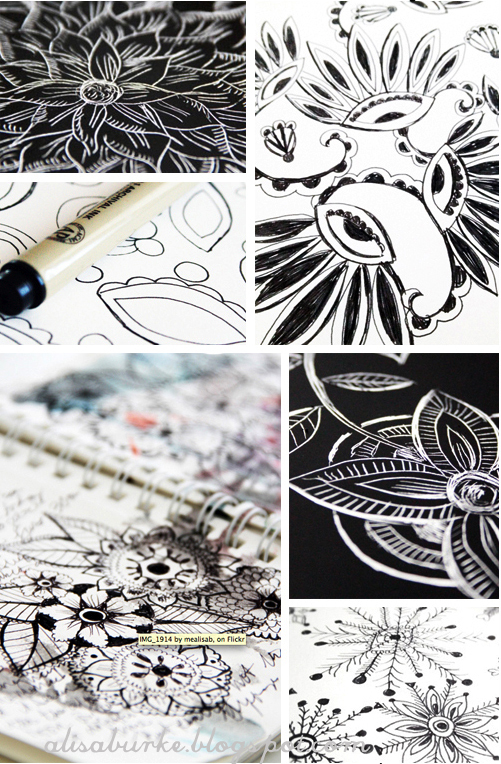 I tend to doodle a lot of random scribbles, swirlies, & flower-type things :) Thanks for the chance to win! I doodle all kinds of things...sometimes just random shapes and sometimes I'll try to sketch something that is nearby! I doodle paisley around notes to self...would love to be in the class! Sounds so fun and freeing! What better than a little , not to little, inspirational class to get our pens out and begin playing. Love to win it and doodle the days away! My favorite doodles are flowers and leaves. Thanks for another great give away and for all the creative joy and inspiration you give from your heart. I doodle everytime I am on the phone. My doodles generally consist of geometric shapes and wavy lines. This sounds like a great class! I love to doodle circles, swirls, and lines. I love doodling flowers and leaves. Your class sounds like a great deal of fun. Thanks for offering this. I try to doodle lots of things bit they always end up as flowers! I like to doodle whatever is around me. I also like to doodle words, lettering. I have just recently found your blog and would love to take a class!! I love to doodle flowers and leaves... I have a flower that I always seem to start with. I would love to win your giveaway! Oooo! I love to doodle flowers, birds, leaves.. things in nature that can't go to wrong :) I would LOVE to be able to challenge myself with this class! I love beautiful doodles.. I love to doodle flowers and abstract designs! Love your classes! I like to doodle little pumpkin head and snowman head people :) Thanks so much for the chance on the class! I love to doodle the day away! I mostly doodle flowers...all my work notes are filled with doodles! I just bought a book on doodling, I want to start using my doodles in my jewelry. I would love to win a spot in your class. I love to doodle hearts and flowers. Wonderful idea for an online class! I love to doodle, especially flowers, but I would love to be able to doodle more, like cats, faces and people. When I'm doodling, it's usually flowers, Scotties, or snails. Thanks for the giveaway! What a fun class! I love your doodles because they are so neat and yet free flowing. I love to doodle random geometrics. What a giveaway! I would so love to be able to take another one of your classes! I love to doodle leaves and flowers! I doodle flowers and stars. Your work inspires me. I would LOVE to be able to take one of your classes! I tend to doodle circular shapes which always seem to evolve into flowers. hopefully that didn't mess up my opportunity to get the class! OMG! I would love to win a spot in your class. My favorite things to doodle are flowers and trees. I doodle little houses and borders! :) Easy enough for me! I always seem to doodle flowers and little caricatures of my 2 kids. I love to doodle letters. Thanks for the chance to win a spot in your class! The class looks great! When I doodle I tend to do flowers or leaves, or eyes. I doodle lots of flowers and spirals. I am continuously doodling flowers, but my favorite thing to doodle is a zentangle amongst flowers. It's so mindless, and almost meditative! !Thanks for this opportunity!! I'm always drawn to flowers when doodling....what a fun class! I tend to doodle flowers and abstract geometric shapes. I like patterns. Would love to win! I love to doodle squares, triangles and flowers! Fantastic giveaway, Thank you! Thank you for the chance to win a spot! I'm really enjoying your watercolor class right now! I tend to doodle swirls, flowers and leaves. I like to doodle leaves and circles and would LOVE to win a spot in your course! Thank you! Flowers! What a fun class, hope I win! Seems like most of my doodles are curves that fill in other curves. Thanks! i love to doodle WHALES! OH OH OH! I love to doodle swirls! After taking a couple of your classes I love doodling flowers. I would love a chance to win this class!! I love to doodle flowers, mostly the fantasy kind that have far too many swirls and dots to ever exist. I'd love to play with doodling a little more and your class looks perfect. Fingers crossed. Im big on doodling flowers and would love to win a class to learn to doodle more! i really really really really hope i win this time!!!! flowers, faces and trees. looks like a fun class! Love to doodle squiggly bits and circles...have been dabbling in zen doodling lately, kind of fun :) Thanks for the give away and congrats on your new digs! I think... flowers and trees. I like doodling geometric shapes and patterns! Thanks for the chance to win! I love to doodle anything and everything from my daily walks and adventures...everything that inspires me to create a better future for myself and future generations. I doodle pretty much anything, I'm a big pattern doodler or doodler of music lyrics... My doodles are a bit of a translation to my crazy thoughts! If I have a writing utensil in my hand i'm doodling !! I doodle shapes and flowers. 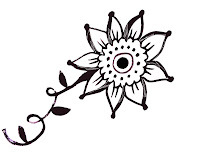 ...flowers, circles, swirls, wavy lines, dots, geometrics...just about anything! I always doodle eyes and flowers. Occasionally butterflies. I love to doodle straight lines and circles.. flowers too.. would love to win, thks for the chance alisa! Flowers, curly cues, and words! I love to doodle random designs that come to me or silly things like my steaming coffee mug. Mainly stars, triangles, and arrows. Sometimes circles within circles. I would have to say flowers are my favorite thing to doodle. Thats because they are the ONLY thing I know how to doodle! Thanks for this awesome opportunity! compulsive doodler, right here! my drawings fit the back side of the church program each sunday. helps me pay attention, promise! everything magically fits into or around one another, but there's usually a crown, an eye ball, a dollar sign, a city skyline, some paisley. dots and things fill in the rest! I love to doodle Indian women in scarfs + Flowers and swirls are my fav. Doodling is very relaxing and it'll be grt fun to join ur class and get inspired. Thanks for the free spots. I love to doodle flowers. I like patterns and shapes. I am a beginner doodler so would love to win a spot. So far I've tried doodling flowers and lettering - loving it so far. I like to doodle wispy trees. I doodle bubbles, or flowers on a vine. I tend to doodle the same thing every time I doodle, and have been doodling the same things since about 4th grade. I could use your class to switch it up a bit! I love to doodle shapes from nature. And I would love to win a spot in your class! so exciting! I love doodling swirls!! My favorite things to doodle are my name, flowers, swirls, and fish. Thanks for the giveaway, Alisa! My favorite thing to doodle are flowers. But I try to use others shapes. It's interesting to explore new shapes. I love to doodle spirals, mandalas, flowers, anything circular! I used to get in trouble for always doodling during lectures. I still received good grades, though! My favorite are flowers and swirlies. And I'm ready to go!!! Wonderful class idea! I love flowers, so I would love to learn how to doodle them! Thanks for this wonderful chance! Have a great week! 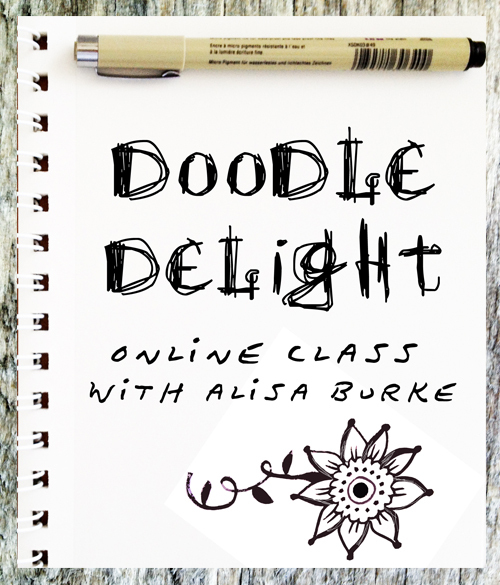 Hi I am so excited to see your new online course is all about doodling. It is the most relaxing and creative thing to do, no rights, no wrongs just DOODLE it is good for the soul. my favourite doodles are flowers,the thrill of creating a 'new' flower species is WOW. Thanks for all the sharing and creativity. Love your work. Heather, Cape Town South Africa, Holding thumbs its me!! Doodling is so cathartic! I can't honestly say I know what I'm doodling half the time or what my favorite thing to doodle is...my hand wraps around the pen and that connection between my sub conscious and my mind takes over and away it goes. I would love the chance to actually sculpt and channel that left-sidedness into much more meaningful and artist designs! Love doodling! i would very much love to get a free spot in your class! and possibly talk about it through my blog! I've always been a flower doodler! I also enjoy doodling letters/words. Thanks for the chance at a spot in your class, it sounds awesome. I love to doodle random geometrics and flowers! I've promised myself not to have any artsy expenditures except what is aboslutely necessary until next payday so a spot in this class would be wonderful!!! I've tried doing a bit of your style of doodle when I took your watercolor class. I'll be taking this class for sure to learn more from you! I love to doodle flowers, spirals and geometric patterns. I love to doodle animals, faces and flowers. And most of all I would love to win a free spot. You`re a great inspiration for me. Thank You. I love to doodle patterns!epecially paisley. I tend to doodle houses and flowers, love to win maybe this time? as much as i try to doodle something different i always end up doodling stars......I NEED HELP!!!!!!!! I doodle spirals, vines with leaves and a word I learned in 7th grade: pneumonoultramicroscopicsilicovolcanoconiosis! I mostly doodle flowers... I would love to win then I can explore new things to doodle! Oooh, another class that sounds really amazing and inspiring! I tend to doodle words quite a lot. I can pick up a word in a song (or even an ad!) on the radio for instance. I always doodle circles I am on the Phone. I love to doodle flowers. Thank you Alisa for this giveaway. I could do with a jump start to get back into doodling and drawing so I would love to win a spot on your class. When I do doodle they tend to be mostly elongated ovals like petals. Often they end up being flowers but sometimes they connect into abstract shapes. I would love to win a spot in your class. I like to doodle flowers and sometimes my doodles ressemble nothing in particular. Thanks for the chance, Johanne L.
Good Morning Alisa. thank you for this opportunity. My favourite thing to doodle would be flowers and leaves. My recent obsession is birds, so I doodle them everywhere - all different kinds - sometimes unaware that another bird is coming out of my pen. I like doodling flowers and abstract designs. but mostly i just love doodling! I like to doodle flowers. Thanks for the opportunity. Doodling flowers for sure!! I just love your classes!! Congratulations on the new space! It looks absolutely amazing. I constantly find myself doodling flowers, eyes and faces. Have a great day! Warm thanks for the giveaway! I'd love to participate in your doodle class giveaway and would so love to win ( ;-D ). I've just signed up for another one of your classes but since I've started with you in the create daily class, I've discovered doodling and for now I mostly doodle flowers and such, sometimes abstract things, or rows of motifs... I find it restful yet stimulating and the prospects and variations are endless!!! I love to doodle anything from nature!!! Thanks for a chance to win a class! I love to doodle flowers! Thanks for the chance to win a spot in your new class! I usually start doodling with lines and shapes, then love to see what they turn out to be! I love doodling flowers, over and over and over. My favorite things to doodle are animals and faces... With my non-dominant hand... Without looking... Wheee! Since I was a kid I've doodled flowers, birds, and fish. I love to doodle little monsters and make up creatures that started off as abstract shapes. Thanks for the chance to win this giveaway!! For some reason, I doodle triangles. Also daisies. My doodles always end up being flowers or boxes and recently I have gotten into the zendoodle phase. Thanks for the giveaway - I'm sure your class will be super! Love, love, love your work! I would love to win a spot - so, so, so wish I could come to your retreat in September! This looks like such a fun class! Thank you for the chance to win a free spot. Fingers crossed! I seem to doodle hearts when I'm on the phone. I tend to doodle flowers and stars. My favorite thing to doodle? that would be Mandalas. Love them to pieces!! I would love a spot in your class. My favorite things to do doodle are faces and letters. Thanks! doodling trees, vines, houses and of course flowers are my favs! very excited about this class! This class sounds like it is made for me! I usually add some doodling to my art journal but want to get more comfortable so I can add it to scrapbooking layouts and cards. I like to doodle lines, dots, dashes, flowers, but I am sure I will learn lots more from this class. Would love to win a spot! Thanks for offering another class and a chance to win a spot in it! I love to doodle spirals. I'm just drawn to them. Doodling is sooo much fun!! I love your blogs on doodling .. they are AHmazing!! My most favorite thing to doodle are words... any shape, form or color! My favorite things to doodle are flowers but I would love to expand on that! I am really good at doodling a left eye, for some reason, and I love to doodle monster/alien creatures. My favs are dragonflies and flowers! Sounds like a great class! I like to doodle random organic shapes. What a great class this is going to be, love that we can get it all in one go too. My favourite things to doodle are FLOWERS!!! I love to doodle celtic knots and flowers. I would love to win a spot. Alicia, Your new doodling class looks fabulous!! My favorite things to doodle are flowers and just random things that I love... watering cans, picket fences, art supplies, etc. I'd love to improve and expand! Thanks so much for the chance to win a spot in your class! Flowers, because they look good even for a non-artist like me. I'd love to learn how to do more. Hi Alisa...the new class is right down my alley...Love oodles of doodles!! Right now I an doodling faces on old book pages.I would love to win a spot in this new class. I like to doodle anything from nature. Would love to win a spot in Doodle Delight! Looks like a fun class I am due foe another online class! Would love to plan a Oregon one of these years to your retreat! Looks like a beautiful spot! Indoodle a lot, flowers and letters a lot!!! I would love to win one of your classes. I always enjoy seeing your pages and what you are doing. So beautiful. My favorite things to doodle are circles, curves, vines, that sort of thing. But really, anything goes! Flowers....I've been doodling flowers since I was a child. Thanks for the chance to win a spot in your new class! I am forever doodling eyes! Sometimes faces and flowers, but I have a thing for eyes. Thanks for the inspiration and the opportunity. I love to doodle flowerss, shells, plants, trees, animals and swirling shapes! Love your art, website and Blog! sounds like a fun class! lately i keep doodling the same little girl image... slight variations, but the same thing over and over again. never seems to get old! I love to doodle flowers and hearts. Thanks for the giveaway. You are so generous. I would love to win a seat!! I love to doodle flowers and leaves, and letters-does that count as doodles?? Oh, this class would be perfect for me: I can't draw but I enjoy doodling. My go-to doodles are eyes, flowers, and geometric repetitive shapes. Thanks for offering the giveaway and good luck with your class! Doodling is so really relaxing! I would love to win a spot to put my new sharpie pens to go use! I really need to take your class! I am not very creative when it comes to doodling and I would love to learn techniques. All I really feel confident doodling is lettering. I have dedicated this year to learning to draw, and your class would be a great help. I love your doodling! Thanks for the opportunity to win a spot! I just signed up for the Doodle class YIPEE!! For now I have been hooked on Zentangling with no pressure to make my doodles look like anything. Your class will push me to another level. Thanks for the change to win a class. I love doodling nature... My dog.. My chickens.. And QUILT ideas! I have always started with triangles until I started drawing mandalas. Now I seem to start with lines through a single point, which if I think about it yields a triangle! I guess the triangle is it! I like to doodle leaves and trees. My favorite thing to doodle? I'm terrible at drawing, so it's mainly spirals. And sailing boats as well (but I'm sure I'm the only one who can tell what they are!). All things bright and beautiful!! I like to doodle all sorts of things, but mainly I keep coming back to flowers! I love to doodle with patterns and shapes. Nothing in perticular but at the end is something amazingly beautiful and spontaneous. Have a great week!! The terrible thing is, I don't doodle! I'm a full-time artist but I've never gotten my doodle groove on. So a doodle class would be perfect for me, I'd really learn something! I love to doodle flowers and hearts.. I know, not very original, lol! I love to doodle flowers, birds, hearts, and houses. I would be thrilled to win a spot in your new class!!!!! Letters,flowers, random shapes! Whatever shows up on the paper! Fun! I doodle faces and flowers. This class sounds so exciting. I like to doodle borders in my visual journal. I allow my hand to start moving across the edge of the page and see what develops. Then I embellish. What I love is that I am not trying to make it look like something specific so I am never disappointed by the outcome. I love doing doodles and then adding them to my paintings. Sometimes they get lost under the layers and sometime they are a little ghostly reminder or a doodle. Doodling is the.most awesome form of relaxation to date on my modest opinion and quire under rated. Looks like such an amazing class Alisa! I love to doodle abstract shapes, more like lines that don't really connect. Not really zentangles, but close. i too, just doodle abstract shapes. i absolutely love your flowers, and have been enjoying your "doodling". i need to learn to be more carefree, and more creative. Total tree doodler... growing up~up~up! And putting down strong roots, too. I like doodling shapes and people. :D Thanks for the giveaway!